Worthy Publishing's Let Food Be Your Medicine: Dietary Changes Proven to Prevent and Reverse Disease has sold 50,000 copies since its release in December 2015. "This is an important topic that needs addressing, and we’re honored to be a part of it." – Byron Williamson, President and Publisher, Worthy Publishing. 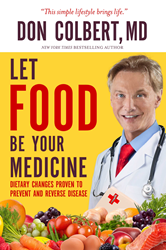 Worthy Publishing announces that Let Food Be Your Medicine: Dietary Changes Proven to Prevent and Reverse Disease, the latest book from New York Times best-selling author Don Colbert, M.D., has sold 50,000 copies since its release in December 2015. In Let Food Be Your Medicine, Dr. Colbert sets out to change the way Americans treat their chronic diseases. By offering proven tools based on extensive research that began over a decade ago, Dr. Colbert shows readers how simple changes in their diet can help drastically improve chronic conditions. Dr. Colbert is appearing on a range of media, including The Jim Bakker Show and other shows seen nationwide on networks like Christian Television Network, Daystar and Cornerstone Television, as well as Kenneth Copeland Ministries. In sharing his personal perspective based on overcoming his own health struggles, Dr. Colbert has inspired readers to conquer chronic health conditions, enhance mental clarity, and increase their chances for longevity, simply by changing the foods that they eat. Dr. Don Colbert has been board-certified in Family Practice for over 25 years and practices Anti-Aging and Integrative medicine. He is the Medical director of the Divine Health Wellness Center where he has treated over 50,000 patients. He is a New York Times best-selling author of books such as The Seven Pillars of Health, What Would Jesus Eat, Deadly Emotions, What You Don’t Know May be Killing You, and many more with over 10 million books sold. Dr. Colbert has been featured on numerous national media outlets such as: The Dr. Oz Show, Fox News Channel, ABC World News, BBC and has also appeared in Readers Digest, Newsweek, Prevention magazine, and many others. Dr. Don Colbert is also an internationally-known expert and prolific speaker on Integrative Medicine. He and his wife, Mary, now reside in Orlando, Florida. Worthy Publishing Group (http://www.worthypublishing.com) is a privately held, independent voice in inspirational publishing, based in Nashville, Tennessee. Worthy has four imprints: Worthy Books publishes a broad spectrum of genres, including current events, pop culture, biography, fiction, spiritual growth, and specialized Bibles; WorthyKids and its Ideals imprint create colorful, interactive children’s books, including VeggieTales and Berenstain Bears, for ages 2 to 8; Ellie Claire produces beautifully crafted journals, gifts and paper expressions; and Worthy Inspired publishes inspirational felt-need, personal growth, and devotional books.